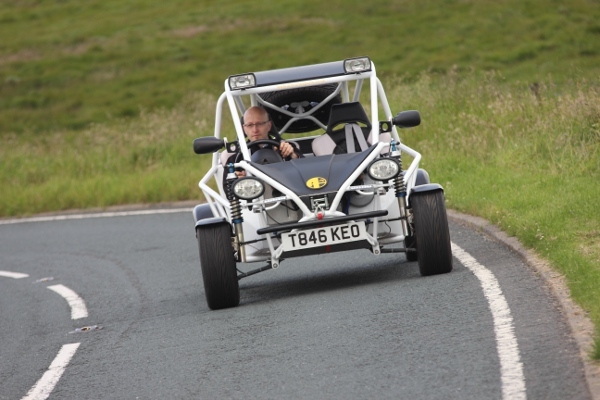 The Animoto buggy is a simple, lightweight fun vehicle which can be used as a pure off road vehicle or can easily be built to be fully road legal and submitting it to an Individual Vehicle Approval test by VOSA. For off road use the IVA specifications need not apply which makes the basic kit an attractive option as you can build however you want and you can have a working buggy built very cheaply. For this option we recommend using the steel wheel option with bead lock so that grasstrack / off road tyres can be run at low pressure to give excellent grip. It is also feasible to use ATV tyres but for this you would need 12 inch rims and hub adapters. Our aim throughout is to make this a really simple car to build but also with the option to be cheap and environmentally friendly by reusing as much as possible from the donor vehicle (Fiat Seicento or MGF/TF). With a standard Fiat 1100 FIRE engine the power to weight ratio is slightly over 100bhp/tonne. This makes the buggy pretty quick but if you are looking for more performance then we would recommend the 16V 1200 from the Punto which is giving around 150 bhp/tonne or the 1.8 K Series at well over 200bhp/tonne. The engine hangs from a cradle which is separate from the chassis so that the buggy can be upgraded to take other engines. Engine choice is not restricted to Fiat, you can use any engine from any small front wheel drive cars. Consider any hot hatchback engine as a possible power plant although a custom made engine cradle would probably be required. We recommend the 1.8 Rover K series engine for a high performance buggy as the weight of the engine is only slightly more than the basic 1100 Fiat unit. When considering power to weight ratio you may find it useful to refer to our car data anlaysis pages. Animoto Sports Buggies is a division of SNA Developments Ltd.